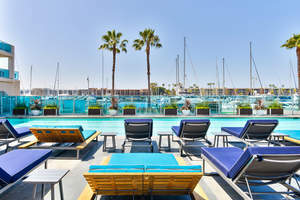 Esprit Marina del Rey has unveiled a newly renovated pool deck for its residents. 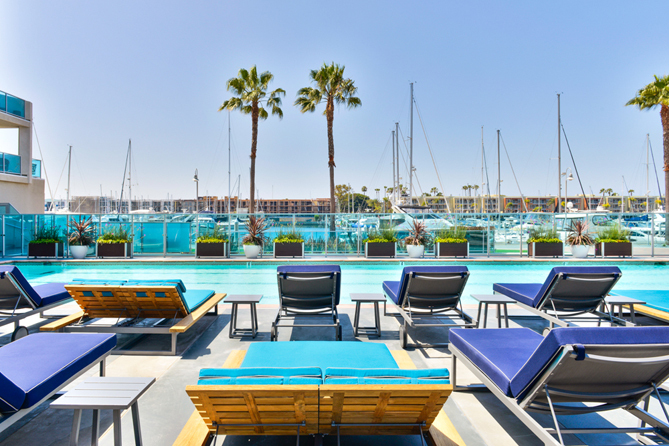 MARINA DEL REY, CA--(Marketwired - Jul 23, 2014) - Esprit Marina del Rey, the Westside's beloved luxury apartment waterfront community, has unveiled a newly renovated pool deck and 5 spa areas for its residents just in time for summer. Set against the backdrop of the Marina, the "sleek and chic resort quality" renovations include new outdoor artwork, televisions, fire pits, cabanas, loungers, outdoor kitchen and an outdoor grill -- all to provide Esprit residents with the quintessential Marina del Rey lifestyle. "Nothing beats a summer in Marina del Rey," said Libby Sill, leasing manager of Esprit. "You've got amazing weather, amazing marina views and plenty of fun social events and activities to choose from on a weekly basis. The new pool deck at Esprit brings all of this to life for our residents. They can watch sports games in the outdoor lounge, cozy up next to one of our fire pits at night and of course, cool off on a hot Saturday afternoon as the sailboats cruise by. It's all about leading a waterside lifestyle." To sweeten pool life at Esprit this summer, food trucks will be parked outside Esprit every other Saturday afternoon. Even sweeter, residents don't ever need to leave the water -- thanks to the Marina del Rey WaterBus, which runs now through September 1st. Added Libby Sill: "A lot of our residents really love that feature and look forward to it all year. It's something that is completely unique to Marina del Rey." These perks are just the beginning of "summertime cool" at Esprit. The community offers 437 contemporary townhouse-style apartments, seven pet parks, a waterfront promenade, heated saltwater lap pool, state-of-the-art fitness center, two-story sport court, accommodating massage rooms, and complimentary daily gourmet coffee. Esprit also features more than 25 floor plans with studio, one-, two-, three- and four-bedroom layouts to accommodate a range of lifestyles and needs. Many apartments come with private balconies or rooftop terraces and all apartments have a view of the water, full-size in-home washer and dryers, stainless steel appliances, eco-friendly Corian countertops and other top-of-the-line amenities. Luckily, there are still plenty of summer days to be enjoyed at Esprit. To schedule a private tour of the community and its new pool deck and spas, call (866) 734-0051 or visit www.EspritMDR.com for more information. Esprit in Marina del Rey is managed by E&S Ring Corporation. With over 50 years in the multifamily industry, E&S Ring has been providing high quality service, dependable results and excellence in management since 1959. The Ring organization's roots are in coastal Southern California, but now branch out to Washington and Northern California. Today, the company manages 11,000 apartment units across the West and 800 boat slips in the Marina del Rey harbor area adjacent to several of its properties. For more information, visit www.esring.com.